It is now possible to enter a chemistry degree course at many UK universities without any formal maths training beyond age 16. Addressing this deficiency requires students to take additional mathematics training when entering university, yet the relevance of maths to chemistry is often poorly appreciated by chemistry students. In addition, many service courses are either too abstract, or aimed at physicists and engineers, for students of chemistry, who are not inclined to study mathematical techniques per se and do not make the connection between the maths they are taught and the chemistry they want to study. Based on the successful at a Glance approach, with integrated double page presentations explaining the mathematics required by undergraduate students of chemistry, set in context by detailed chemical examples, this book will be indispensable to all students of chemistry. By bringing the material together in this way the student is shown how to apply the maths and how it relates to familiar concepts in chemistry. By including problems (with answers) on each presentation, the student is encouraged to practice both the mathematical manipulations and the application to problems in chemistry. More detailed chemical problems at the end of each topic illustrate the range of chemistry to which the maths is relevant and help the student acquire sufficient confidence to apply it when necessary. B. Algebra and Basic Skills. 18. Functions of one variable. 19. Functions of many variables. 20. Equation of a straight line. 23. Real and imaginary numbers. 29. Logarithms to base 10. 36. Scalar and vector productsE. Calculus. 40. Differentiation of combinations of functions. 48. Specific methods of integration. "By including problems (with solutions) the student id encouraged to practice both the mathematical manipulations and their application to the problems in chemistry...would make a useful addition to the bookshelf of a chemistry undergraduate." "Every new idea is explained using real chemical examples...the problems and worked answers at the end of each section are excellent, and a valuable aid to both the students and lecturers." "Students will be able to work through its content at their own pace, wihtout feeling overwhelmed by the difficult sections or patronised by the simpler ones. 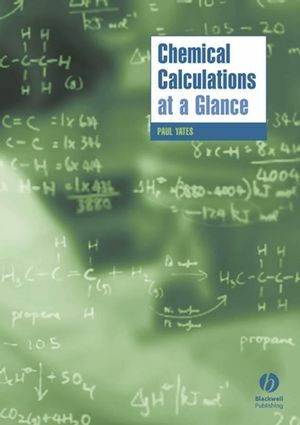 I would not be surprised if Chemical Calculations at a glance became the standard recommended textbook for the remedial maths classes in most UK chemistry departments." * Links the maths with the chemical applications in integrated, double page presentations, helping the student to appreciate and understand the relevance and importance of the maths. * Detailed guidance on the mechanics of the mathematical manipulations required, set in the context of chemistry, helps to develop the student’s mathematical ability and understanding. * Practice problems (with answers) at the end of each section include both simple mathematical practice and real chemical examples, to give the student a thorough grounding in the mathematical techniques required. * More detailed problems, again with answers and covering a wider range of chemical themes, at the end of each broad topic give the student the ability and confidence to recognise when particular mathematical manipulations are required, and to apply them when necessary.